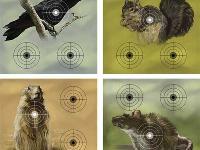 Crosman Varmint Target Block. Animal. 8" x 8" high density foam block traps pellets and BBs. 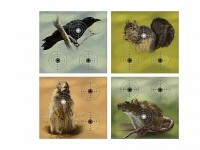 Each side depicts one of the Crosman Varmint Targets either a crow, squirrel, prairie dog or rat. Each target has 3 bullseyes on it. 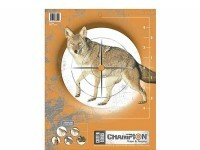 Two bullseyes are on the background, and one is on the most appropriate place on the animal for a humane kill. Easy to use indoors or out. 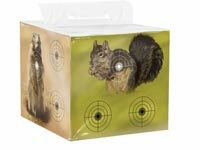 For use only with airguns shooting less than 700 fps. Things I liked: Light weight, easily transportable, great for shooting <700 fps airguns in the house. 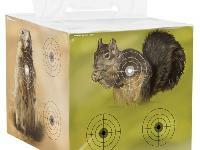 I used it today to test a new-model Daisy #25 BB gun at 15 feet. Worked great. The holes are well-defined, at least when the block is brand new but I've only put 10 BBs into it so far. Things I would have changed: nada…it is what it is. What others should know: A reviewer before me wanted replacement targets for it. 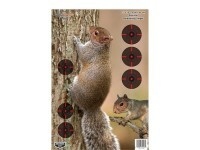 The info on the shrink wrapped targets says "Replacement targets available at www,crosman.com". You might want to put it in a cardboard box open on the target end as it gets used, to avoid mess. I paid $20+ bucks for it including tax at a well-known sporting goods chain here in California, so Pyramyd's much lower price is a bargain! 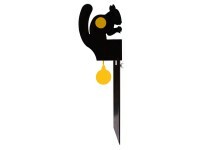 Things I liked: This is exactly what I was looking for as a back yard target that would contain the pellets and BBs that I shot. I own a couple of traps but they both ricochet the pellets and BBs. Rather than use replaceable covers, I simply tape targets to the unit. Things I liked: Been holding up well although does tend to leave a styrofoam mess especially under automatic fire (.177 cal). I am a fairly consistant marksman with a variety of guns and my shot groups are consistantly tight. I figure it took around 300 shots to bore a hole half way through this about the diameter of a quarter. Things I would have changed: I know this can't be helped, but if this could be made so when hit it makes less of a mess. 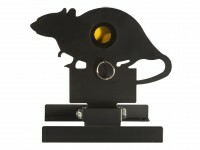 What others should know: If you need a quick target.. or four.... this does the job but it does make a mess.